​Manchester City refuse to be knocked out of the Women's Super League title race after a comfortable win in the latest round of fixtures saw the 2016 champions stay within six points of runaway leaders Arsenal. City hammered Yeovil 4-0 away from home, with Nikita Parris scoring her 10th WSL goal of the season in the one-sided rout. Caroline Weir, captain Steph Houghton and Claire Emslie also netted for the visitors to put them on 21 points after nine games.  @keira_walsh: "It was important we got a professional job done and took three points ahead of the big game against @ArsenalWFC. In what was a first game without influential midfielder Jordan Nobbs after a ruptured ACL put her 2019 World Cup dreams in doubt, Arsenal kept up their incredible winning start to the league campaign by putting four goals past Brighton. It was a ninth win from nine WSL games this season for the pace setting Gunners, with usual suspects Vivianne Miedema and Danielle van de Donk on the scoresheet alongside Dominique Bloodsworth and Beth Mead. Brighton actually scored first through Ini Umotong. Next for Arsenal is a visit to Manchester in the biggest game of the season so far. Elsewhere, Birmingham made it two wins from two after condemning a struggling Liverpool to a fourth straight league defeat. 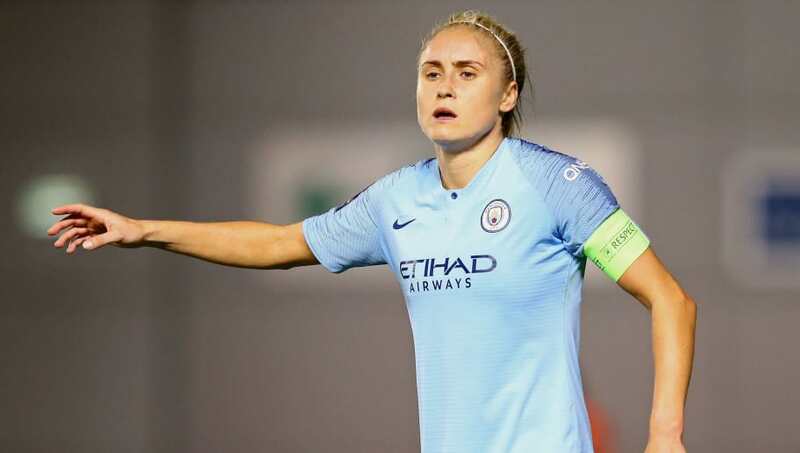 Emma Follis scored inside three minutes for the Blues, who remain only two points behind Manchester City, with Connie Scofield scoring the second. Reading ensured that Everton remain rooted to the bottom of the table by inflicting a sixth defeat in eight games on the Toffees. Hannah Cain had actually given the visiting Merseysiders an early lead, only for Brooke Chaplen to cancel it out and later score the winner for the Royals. West Ham ended a run of two consecutive WSL defeats by beating Bristol City to put considerable daylight between themselves and the foot of the table. An early goal from Alisha Lehmann and a late second from Jane Ross saw the Hammers prevail 2-0, leapfrogging Liverpool into seventh place. Losing the chance to build on recent momentum, Chelsea found themselves out of action this weekend as the odd club in the 11-team league. Down in the second tier Women's Championship the fight for promotion to the top flight WSL continues and there is a new leader. Manchester United capitalised on Tottenham not playing to move into first place after winning 8-0 against Millwall. Just below the two automatic promotion places, Durham dropped points against Leicester, while Charlton move to within two points of second place Spurs by beating Crystal Palace. United and Spurs each have a game in hand on their two main promotion rivals.